Scheduled Services are intrinsically linked to an invoice. 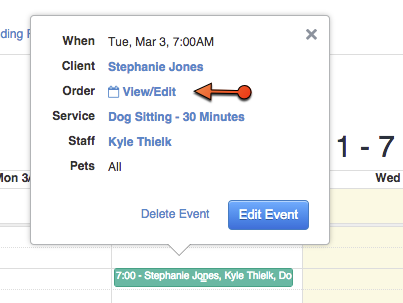 Each service that is scheduled for a Client becomes a line item on an invoice. This makes it extremely easy to automatically generate invoices and bill your Clients. If however, you decide that certain services are better off in a different invoice than originally planned you can easily move them between invoices by following the instructions below. In order to move the services we need to load the destination service order in the Calendar. Visit the Client’s profile page. Click on the Services/Invoices tab. Find the invoice in the table and click the “Calendar” link. On the calendar, find an existing event that is part of the destination service order. Click on the event to bring up the quick info popup. Next to Order click “View/Edit” link. Now that the Destination Service Order has been loaded in the Calendar, we can begin moving services into it. If there is only one or two services that you want to move, it is often quickest to do a single claim at a time. Click the “Claim Individual Services” button. 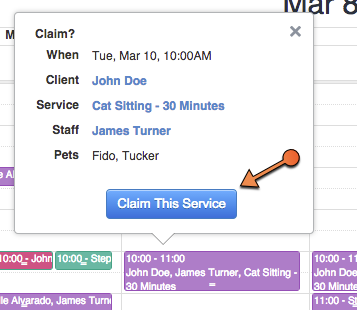 Find the service that you want to ‘claim’ on the calendar and click on it. A new popup window will appear. Click “Claim Service”. Continue claiming as many services as you want. When finished click the “Finish Claiming Services” button. Note that services can only be moved between invoices that belong to the same client. When claiming services, we will automatically filter the calendar to only show events belonging to the Destination Invoice’s client. When you are finished claiming, we will automatically go back to the calendar as it was before. You can also claim services in Bulk by selecting events in a specified date range. For example, you can move all services for Nov 1 – Nov 30 into an invoice with just a few clicks. 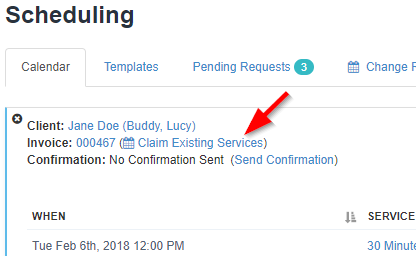 Click “Claim Existing Services” from the invoice box. Click the “Claim In Bulk” button. A new screen will appear where you can select the date range you wish to search in. Once a list of events have been returned, you can then pick and choose which events you wish to claim. To select all at once, click the “Check All/None” button. When ready, click the “Bulk Claim Events” button. The result of each event will updated to reflect the status of the move.